Here's a giveaway for a nice laptop accessory. How many times has your lap gotten too warm from using the laptop for too long? Here is an option to help you out. The review is a guest post courtesy of Karren Haller from Oh! My Heartsie. The giveaway follows the review. 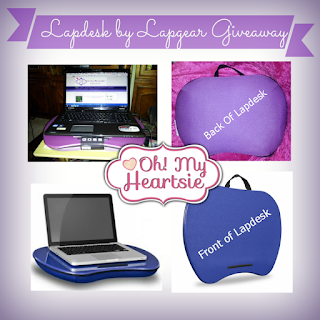 Be sure to enter by February 13th if you'd like to win the Lapdesk. "Lapgear Platinum Series 500 Lapdesk"
This Giveaway is Open To US and Canada Residents!! I have never had a lap desk or lap tray to work on so this was going to be fun to try the LapGear out, since I change from a desk to a chair or the couch to work I needed something sturdy to work on. I found that it works perfectly. The LapGear I received for my review comes from the Designer and Custom category and is in the Platinum Series. It is 17.3 Inches and is very lightweight. I choose a purple one and it is great. It fits in my lap perfectly, is curved which fits snugly against my lap as you can see in the photo and holds my laptop in place as there is a bar that keeps my computer from moving. As you can see the in the picture the Lapdesks comes in some great colors. by notification or Oh! My Heartsie once winner is confirmed.